A lot of people have their own opinion on Jim Cramer, some good some bad. I on the other hand think he is a great entertainer with his show “Mad Money”. I also love his books that he writes, they are very informative and his methods he uses are Genius in my opinion. Now mind you they are for what he calls “Home Gamers” that do not have professional market experience nor the time to dedicate fully towards the market. I use Cramers books as a means of learning new strategy, or gain a different perspective of the market and how it works, i mean the guy did run a half a billion dollar hedge fund. I also do not solely use his methods and nothing else, i try and learn every strategy or method possible and Frankenstein them all, this way i take what i want out of it and come up with my own working strategy. 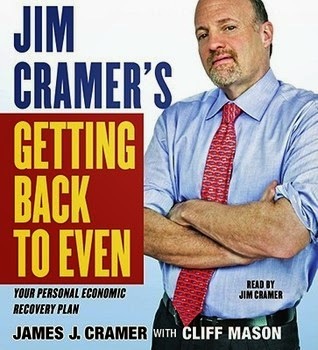 Cramers latest book “Getting Back to Even” is very well written and geared towards individuals that have lost a substantial amount of money in the not only the market, but IRA’s, 401k’s, and the Housing market. His tone when writing this book is very positive and encouraging, makes you feel that you can “get back to even”. I literally read this book in a week, only because i love learning this stuff and cramer makes it interesting. Listed below are the chapters in the book, and as you can see he covers just about everything. I wont go chapter to chapter detailing what i like and dislike, but i will inform you of my favorite parts, just to hook you so you go out and read it yourself. This book is well worth the time and effort you put in to reading it. Jim as we all know from his show preaches diversification, well of course he does it again in this book. This time he goes in more detail as to why and how important it really is. One of the main benefactors of being diversified are the companies that pay you to own their stock, we are talking dividends. I always new about dividends and how they somewhat work, but after reading his chapter on them, well i thought i was a pro after it. The methods he presents about dividends and how to play the company that pays them are truly gold and makes complete sense. He helps you not only find these good company’s paying those juicy high yield dividends but also what to look for when you are doing your homework, which what he says is up to date with this new market we are in. The explanations he gives are in plain English and in such rich detail, which makes you feel as if you know dividends and could teach them to someone else. Now i have always been curious about stock options and how they actually work, but when reading about them i just kinda through up my hands and stick to the regular common stock. Well one of Jim’s tactics to getting you “back to even” is playing with options, he does a great job of getting you to read those chapters even if you are not interested in options. So i take a dive into them and see what he has to say. Jim gives a excellent description of options and explains exactly what they are without giving you a bunch of useless terms or jargon. I truly and finally understand options and how they work just by reading this chapter and feel that much smarter now. His second chapter on options titled “Taking Options to the Next Level: Advanced Strategies” gives you a very sneaky yet cleaver way of using options to your advantage with very minimal risk if any risk at all. I wont give his tactic away but i will say it involves both options and common stock in the same company, which if you apply this strategy correctly it could bring a nice return your trading account. I will be experimenting with this tactic in the new year and am excited to see the results, all else fails it will be a great experience. I can honestly say that Jim Cramer does care about the regular investor and i am very appreciative for him to share is wealth of knowledge and wisdom with his readers and viewers. With that being said you as the reader can find this book not only entertaining but very informative. Cramer iterates over and over how much he thinks this is a golden opportunity in getting back in the market and buying up those beaten down stocks and recovering your account. I believe this is his best book yet and recommend it to everyone!